BIEAP Time Table 2019 announced for AP 1st and 2nd year Intermediate March Final Exam Dates 2019, Download AP Intermediate Time Table 2019 with Practical Dates for BOI IPE Public Exam Dates at http://bieap.gov.in…. 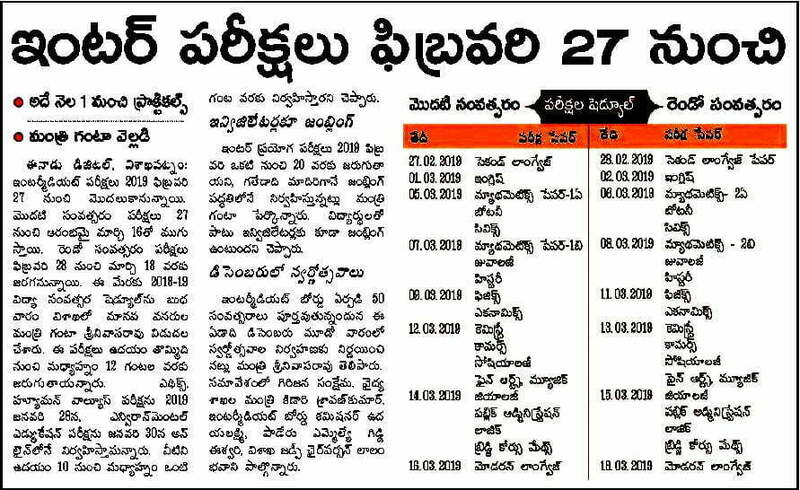 Andhra Pradesh State Intermediate Education Board (BIEAP) has announced the 1st and 2nd year intermediate annual final public examination test schedule with practical teat dates for both of Junior and Senior Intermediate Students, and the BIEAP has announced the BOI IPE March Final Exam Dates 2019 through Minister of Education at a Press announcement. The students who have wish to appear in March annual final examination tests those 1st and 2nd year students can follow the BIEAP Intermediate Time Table 2019 with subject wise Practical dates for all general and vocational course students. According to the BSEAP announcement the intermediate public examination tests are started from 27th February 2019 with first year students, and those final exams are closed on 18th March 2019 with senior intermediate students, and the BOI IPE exams are schedules in single session in a day for the timings of 9 AM to 12 PM (3 hours). State Minister of Education announced the practical tests of Environmental Ethics & Human Values Examination Test scheduled on 28th January 2019 through Online with the time period of 3 hours (Morning 10 AM to 1 PM). The Students can follow the AP 1st and 2nd Inter Time Table 2019 with Subject wise exam dates for the annual final public examination tests. The Education Minister of Andhra Pradesh is announced the BIEAP Practical Test Dates 2019, according to the BIEAP announcement the practical test will be started from 1st February to 20th February 2019 in Jumbling system, and the Minister of education announced from this year the Jumbling system applicable for both of students and invigilators. The BIEAP students will have any doubts on the exams please contact to your school teachers and write your query as a comment we will give reply with solution.